HALO’s unique design is also patented… it’s much bigger, wraps around top and bottom to a maximum rear depth of almost 100mm to improve room isolation and absorption without dominating the room sound. Its textured and wave-formed surface also helps diffuse direct sound. Market research revealed that many people have a hard time with getting a good performance when using other reflection filters because they are not very ‘creative-friendly’ environments. The HALO’s form and colour scheme is designed to create a more ‘organic-feeling’ space for the performer to work with. 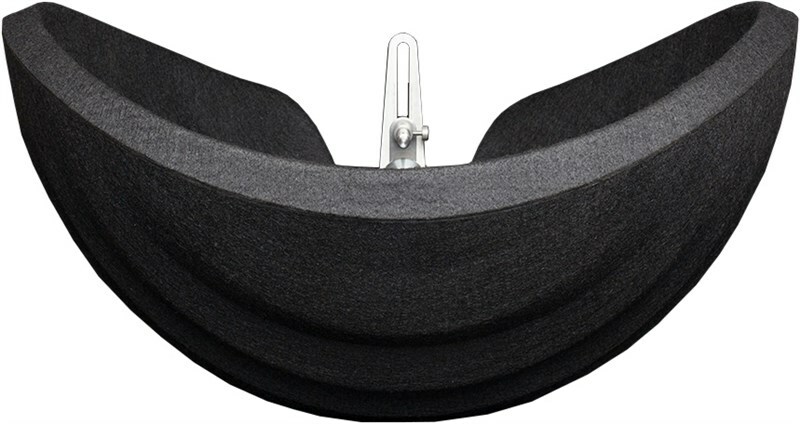 The HALO is made from a patented PET felt which is one of the most lightweight and efficient, technical acoustic products available on the global market today, making it ideal for use in a reflection filter. The lightweight material design, coupled with beautifully engineered ‘easy-mount’ hardware, means the HALO is quick and easy to set up, stable on mic stands, and sounds and looks fantastic.